Sarah Epstein spoke to Robyn Walton, Sisters in Crime’s Vice-President, about her debut YA novel, Small Spaces (Walker Books). Sarah is on a Sisters in Crime panel, YA Crime – Is it all grown up? 8pm Friday 22 June, Rising Sun Hotel, cnr Raglan Street and Eastern Road, South Melbourne Click here to book. 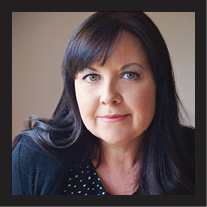 Sarah, you’ve written a psychological thriller that’s being pitched to a Young Adult (YA) readership. I’m hearing your book is also being enjoyed by adult readers. Did you always intend to write for a specific demographic? I always intended for Small Spaces to be for teen readers because Tash, the protagonist, is seventeen and struggling to find her independence. I knew this would resonate with a YA audience and I wanted to write the kind of thriller I would have adored reading myself as a teen. Being a big fan of adult thrillers, crime and domestic noir novels, I found myself writing the story in a nonlinear narrative structure and touching on themes that adults could probably relate to as well. So while I had a sneaking suspicion it might have crossover appeal, first and foremost I wanted to craft a story that teen readers would find intriguing and unputdownable. As a successful illustrator and designer, you’re already used to seeing your creative output on-screen and in print. Does it feel much different having your first novel in the stores? It feels like a much bigger personal achievement because I’ve wanted to be a published author since I was a little girl. Seeing my books on shelves brings me such an immense feeling of satisfaction because it’s the culmination of a lifelong dream and so many years of hard work, hope, rejections and perseverance. In some ways it’s not much different to sending my design or illustration work out into the world and being terrified of how it will be received. As creatives, so much of ourselves is poured into our work and it’s hard not to take criticism personally. But writing pushes and challenges me so much more than design work ever did, so if people read my work and love it, it means so much more. Tash Carmody, your protagonist, is about to start her final year of high school when she’s publicly mocked by a fellow student, who calls her a “whackjob” and reminds her of an embarrassing incident from five years earlier. You decided to let your readers know upfront about Tash’s history of what her mother calls “issues” and her psychiatrist calls “challenges”? Yes, this ongoing battle with anxiety and phobia is a big part of who Tash is and I wanted readers to have that insight from the very first page. It directly relates to Tash’s desire to lead an independent life by proving to her parents (and herself) that she’s moved on from her troubled childhood. Questions surrounding Tash’s mental health are raised quite early in the story because it relates directly to Tash’s past and also impacts her future. Soon we hear about Mallory Fisher, another girl with ongoing psychological problems. Mallory’s history brings unresolved crime into the story. Can you tell us a little about this? Mallory Fisher was six years old when she disappeared from a carnival and turned up again seven days later in a remote area of national park. She had no memory of where she’d been, whether she’d wandered off or had been taken. Tash and Mallory share a connection because Tash was in the same class as Mallory’s brother, Morgan, at school, and Tash was convinced Mallory was led away from the carnival by her imaginary friend, Sparrow. Nobody believed Tash and she was accused of lying and attention seeking, so when Mallory’s family moves back to Tash’s home town, everything starts to spiral for Tash again. “The last time we saw each other Morgan was sitting in the back of a police car.” Is a revival of that friendship a safe move for Tash? For Tash, seeing Morgan again is both a blessing and a curse. Their innocent friendship is one of the happier memories from Tash’s childhood, but what happened to Morgan’s sister and the resulting fallout for Tash is also one of the worst. So there are a few question marks surrounding Morgan and whether it’s healthy for Tash to be spending so much time around the Fisher family in case she regresses into behavioural and mental issues of the past. Tash’s Aunt Ally also pops up, “keen to reconnect after all these years of absence”. It was at Aunt Ally’s house, years ago, that Tash started getting scary night-time visits from a hooded creature who looked like a gargoyle. Tash’s mum is right to be uneasy about Tash accepting Ally’s invitation to stay? Tash’s mum has concerns about her daughter doing anything away from home as she worries Tash is not equipped to handle situations on her own due to her ongoing anxiety. The imaginary friend Tash spoke about all those years ago, as well as other behavioural issues at the time. is why Tash’s mum sought therapy for her daughter. Tash’s mum was satisfied by the psychiatrist’s findings that her daughter’s behaviour had stemmed from loneliness and feelings of abandonment. So she definitely feels uneasy about her daughter revisiting the place where things started to go off the rails. The prospect of another stay in Ally’s house takes the story towards horror territory, and maybe even the supernatural. How do you feel about mixing genres? I have no problem mixing genres as long as it strengthens a story and doesn’t detract. I think readers need a sense of what kind of book they’re reading from the start though, or else they might feel like they’ve been tricked by the author and become disgruntled or frustrated with how things play out. You insert transcripts from Tash’s conversations with her psychiatrist over the years since 2008, and Tash tells us her current-day story in the first person. How did you go about getting Tash’s voice right? Tash’s seventeen-year-old voice came very easily to me, but her eight-year-old voice needed a bit more finessing. For her conversations with her psychiatrist, I had to draw on how my own kids might respond to questions from an adult they didn’t know very well. The flashback scenes told from Tash’s eight-year-old perspective took a bit of tweaking to get right as well. I had to use more simplified language and tap into child-like reactions and logic for the situations Tash found herself in. Sarah, is there anything else you’d like to say about Small Spaces? 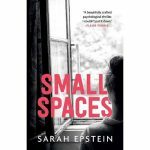 If you enjoy crime and mystery with some psychological suspense, a few nail-biting thrills and a decent dose of creepiness, I hope you’ll consider picking up Small Spaces. Thank you for having me, Robyn!